The books you read can provide fodder for your blog posts. You don't have to write a boring book report like an elementary school student. Use the four techniques I describe below to punch up your book-related blog posts so they attract, inform, and entertain your readers. Pick a quote that resonates with you and is relevant to your target audience. For example, I thought "YES!" when I read the following advice for writers in The McGraw Hill 36-Hour Course: Business Writing and Communication: "...give me the information in the order I can use it." I wrote a blog post explaining how that advice applies to members of my audience who want email recipients to act on their information. First I told the readers why they should care about the quote. Then, I shared the quote. Finally, I gave an example of how they could use the quote's advice. You can see how I did this in " Email writers, think about this quote." You can't explain an entire book in one blog post, but you can go into detail on one narrow topic, as I did in " Reader challenge: How can investment and wealth managers apply this tip?" In this case, the first section of my blog post focused on the author's tips without commentary by me because her tips were straightforward. The second section was my call to action. I asked readers to comment on how they apply the author's advice. In " 3 ways to speak plainly while giving financial advice," I complemented technique #2 by asking author Kathleen Burns Kingsbury to elaborate on one of her book's tips. This gave readers some knowledge they couldn't find in her book. Asking an author for a quote is also a great way to start or deepen a relationship with an author whom you respect. Publishers are trying to generate publicity for new books, which can benefit your blog. For example, McGraw-Hill, publisher of Meir Statman's What Investors Really Want, offered me a guest post from Professor Statman. I came up with the topic after reading the book. If you read a book you like (or see a press release about an upcoming book of interest), consider requesting a guest post from the author. Some authors make a virtual book tour ---a series of guest posts, often spread over days, or even a month ---on blogs. For example, Statman's blog tour ran from Nov. 29 to Dec. 15, 2010. If you liked this article, you may also enjoy " A top technique of financial advisors who blog successfully." 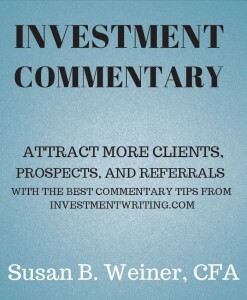 Attract more clients, prospects, and referral sources by improving your investment commentary with four pages of the best tips from the InvestmentWriting.com blog. Tips include how to organize your thoughts, edit for the "big picture," edit line by line, and get more mileage out of your commentary. Available in PDF format for only $9.99. Financial Blogging: How to Write Powerful Posts That Attract Clients is available for purchase as a PDF ($39) or a paperback ($49, affiliate link). Could members of your organization benefit from learning to write better? Hire Susan to present on " How to Write Investment Commentary People Will Read," " Writing Effective Emails," or a topic customized for your company.